Gary Auerbach is a dinosaur in a digital world, producing rare and luminous platinum photographs through a painstaking, antiquated process. 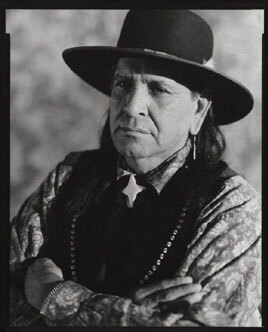 Thirty of his portraits now are on exhibit at Tucson International Airport, all striking American Indian faces with brief interviews. 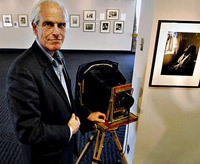 His photographs will outlive us all: Platinum prints last hundreds, even thousands of years. Democratic congressional candidate - has plenty of patience. He also is blessed with a gift for serendipitous meetings with people whose faces richly deserve to be preserved for posterity. As he honed his art, he says, he sought a subject that "people will want to look at 500 years from now." Clearly he has succeeded. When he donated 44 platinum photographs to the Smithsonian Institution, he was asked to interview the people he had photographed. The five questions he wrote first were reviewed by Ofelia Zepeda, a Tucson Tohono O'odham author, recipient of a MacArthur genius grant and a linguistics Regents professor at the University of Arizona. The results, like the photographs, are timeless. "Fifty years from now, this body of work will have just as much meaning and maybe more so," Auerbach notes. "It's not that long ago we were still sending (tribal) people off to boarding camps." Tamara Lake, Dine (Navajo), of Tucson Tamara used to go 20 miles to the trading post with her grandmother to haul water and buy hay for the horses. 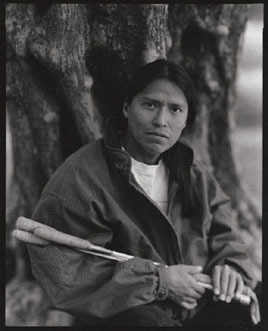 Consider the recollections of Jonathan "John" Thompson of Tucson, who turns 46 on Feb. 5. Asked for "a specific memory that stands out," he recalled: "Government Boarding School, where we weren't allowed to speak Navajo. That experience stays with me always, some good, but mostly negative experiences." Asked in 1996 how his life differs from his parents' or grandparents', he wrote: "My parents still have no electricity or running water. I live in the city with all the amenities of modern life." And while Thompson continues to practice prayer, meditation and sweat lodge ceremonies, he fears the fate of such tribal traditions. "Many of the things I saw and experienced as a child will not be the same experience as our children have," he said. "I am afraid some of the old traditions will not be carried on. "Thompson's troubling prediction is offset somewhat by Auerbach's work, a veritably permanent preservation of people whose ancestors were marginalized, at best, by American society. 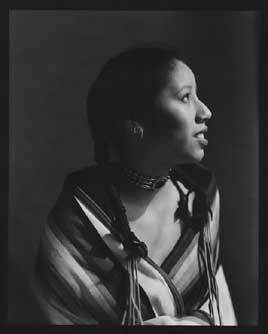 Until now, the Indian voice in photography "has been most striking for its silence," wrote Jennifer Brathovde, a Sisseton-Wahpeton Spirit Lake Sioux and the Library of Congress curator of photography and prints of Native peoples. 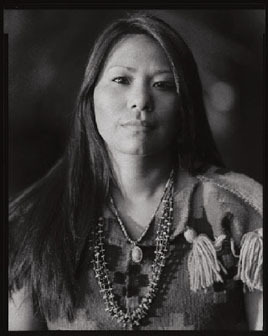 She was born in 1992 to the San Carlos Apache and Navajo tribes. 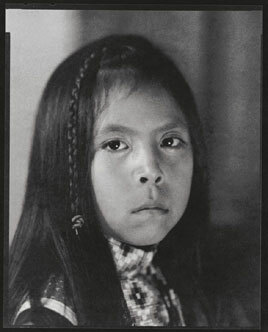 "The indigenous voice - an essential element notably absent in most images of Native Americans - now is celebrated in this path-breaking, harmonic union of images and words," she wrote of Auerbach's work. These voices - such as that of Tamara Lake, a Tucson Dine (Navajo) who just completed a tour of Iraq with the U.S. Army - must be preserved. Now Auerbach's slice of American Indian life lives on in the Smithsonian and in the homes of his subjects, each of whom was given a copy of his book, "We Walk in Beauty." The title comes from Ruth Benally, a Dine born Aug. 26, 1923, at Hogan on Big Mountain in northern Arizona. Asked what she sees for the future, the elder told Auerbach: "I always pray for my self, my children, and my grandkids. We walk in beauty!" Their beauty lives on. Billie Stanton may be reached at bstanton@tucsoncitizen.com and 573-4664. Thanks, Billie Stanton, it's always refreshing to have some blanks filled in about some of the beauty around us. Also to be reminded that beauty is not necessarily a relative concept, but something that can be experienced on all our walks in life. The airport is a great place for these shots!